Today we have a very special interview — Daniela and Milo Lee are our first Family Volunteers at ArtStarts! 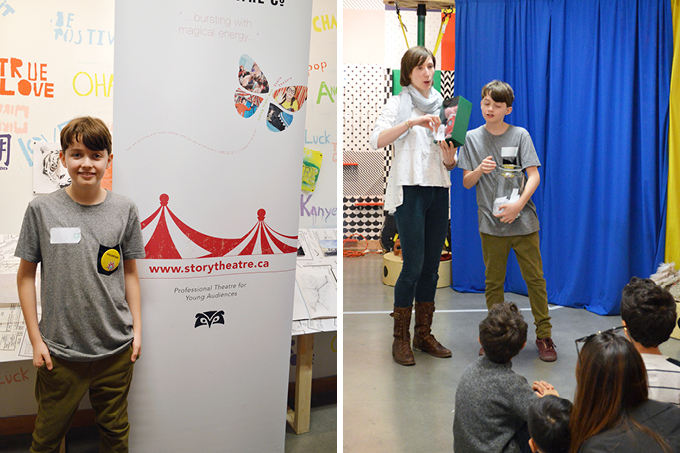 You may have met this dynamic mom-son duo at recent ArtStarts on Saturdays events, where you'll find them both helping out and engaging families in creative activities. Hi Daniela and Milo! Can you tell us a bit about yourselves? Daniela: Professionally, I am the founder and creative director at We Are Local — a guide to locally-owned businesses in Vancouver and Victoria — and Small Wonder — a magazine for kids and their grown-ups. On my downtime I enjoying reading design magazines, participating in 5km races with Milo and doing crossword puzzles over a good cup of coffee. Milo: I go to school and am in Grade 6. I like drawing, playing video games, running, hanging out with my friends, drinking bubble tea and playing Yu-Gi-Oh. What inspired you to volunteer at ArtStarts? Daniela: The arts have really given us a lot as a family, so when looking for a place to give back ArtStarts was a natural fit. Milo: I am passionate about art. Its pretty cool that I can volunteer somewhere where they bring arts to children at schools. What has been your favourite aspect of volunteering so far? Daniela: Watching Milo take on the volunteering tasks on his own... proud mama! Milo: Doing the collage activity with Kate. What is it like volunteering as a family? Daniela: It's a wonderful way to spend time together. It is a way to lead by example in instilling a sense of commitment to being a contributing member of a community. What do you like about the arts? Milo: I like to draw and am getting into painting. I even learned to make my own acrylic paints. Art can be a hobby or a job. I like seeing how a small sketch can turn into a large piece of art. And how art can be told in so many different ways. What advice would you give to kids who are intimidated by the arts? Like the kids who say they "can't draw" or "can't dance"? Milo: Just do it — there is no right or wrong way to make art! How do you feel families benefit from being involved in the arts? Daniela: The arts can offer so much to families. For our family, the arts have benefited us in so many ways — to communicate our ideas and feelings, to learn about and discuss new ideas, and also as a fun way to spend time together, be it at a gallery, performance or public space. Do you think there are currently enough opportunities to experience the arts in your school? If not, what changes would you like to see? Daniela: I think there is definitely an opportunity to have more engagement with the arts in school. More traditional art classes would be great, but also finding ways to incorporate the arts into other subjects would be an asset for all students. Milo: No, I'd like more art classes and performances. Maybe extra budget from the government would help. Daniela: Creativity is exciting; it's that moment when someone introduces a new way of expressing an idea or solving a problem. Milo: Creativity is thinking outside of the box. Thank you, Daniela and Milo!